Mike over at Vox Political also has a story reporting that the Tories have won a knife edge vote against a motion that would have obliged Britain to take in about 3,000 child refugees a year. The motion was tabled by the Labour Peer, Lord Dubs, who was one of those fortunate enough to be given sanctuary in Britain away from the Nazis through the Kindertransport in 1939. Keir Starmer, Labour’s Shadow Immigration Minister, has stated that this won’t stop their efforts to get the bill passed, and that the fight will go on. Mike has covered the problem of child refugees before. They were an issue twenty years ago, when Yasmin Alibhai-Browne in her column in the Independent urged Britain to take them in. The issue has become more acute since it was revealed that over a hundred of them have just disappeared after the Calais migrant camp, the ‘Jungle’, was levelled. Mike’s article on that incident highlighted the fact that the children were at risk, not just of poverty, but also of exploitation. He asked rhetorically if this was acceptable. Simple humanity says it is not. But apparently, the Tories think so. Or at least, if there’s a choice between saving the government and saving children, they’d rather bail out Cameron. This is truly horrific. Mike today put up a piece from the Independent reporting that 129 children from the Calais refugee camp, ‘the Jungle’, have gone missing since it was bulldozed in March. Despite the attempts to clear the site, there are still 4,946 asylum seekers living there, including 140 in the shipping containers. This includes 294 unaccompanied children. The article states that the British charity, HelpRefugees UK, stated on its website that this was unacceptable, and called on the French authorities to do more to safeguard the 294 unaccompanied children alone in the camp. Mike simply asks the obvious question if anyone thinks this is acceptable. It clearly isn’t. And it shows how terrible conditions must be in some parts of the world, that some parents are so desperate to send their children unaccompanied on the immense journey to the West. This isn’t a new or recent phenomenon. Yasmin Alibhai-Browne in one of her columns on the plight of refugees in the page of the Indie way back in the ’90s or early years of this century, reported how unaccompanied children were being put onto trains in order to get them to Europe. I also heard a story, which may well be garbled, that a large percentage – perhaps half – of the unaccompanied Somali children, that had been given asylum in Sweden, have vanished. Which is also chilling, if true. There are very obvious dangers to children’s welfare and safety here. Not just the threat of keeping body and soul together on the streets, but also danger from the real, human predators operating on the fringes of society. Like paedophiles and other forms of human brutality and exploitation. And it shouldn’t need to be said that if the children don’t have any kind of accommodation, and aren’t being given schooling, then they’re not going to acquire the education and skills they require to survive or make a proper living in western society, if they’re finally allowed to stay here. Which, unfortunately, may well be the point. Clearly, I hope that the French authorities do take steps to ensure the safety of the remaining unaccompanied children, and at least do something to try track down the others. As you can see, it’s set in a factory, Schmidt & Co, Clothing & Boot Manufacturers, and shows a stout, upright British workman being shown the door by his fat foreign employer, while coming in the back way is a dishevelled foreigner, whose bags are marked ‘To England’, and ‘Steerage to England’. THE ALIEN EMPLOYER (to British workman): You can go now: Mine friend, who has just arrived, will do your work for half your wages. The caption also notes that it came from the 1906 Tory protectionist pamphlet, Topical Tips for Typical Tykes. I’ve discussed this cartoon before, when one of the commenters on this blog, Jess Owen, supplied a bit more information on it to me. Apart from being generally anti-immigrant, there are also distinct anti-Semitic overtones. The term ‘alien’ on its own just means ‘foreigner’, but it was also used extensively in this period to mean specifically Jews. 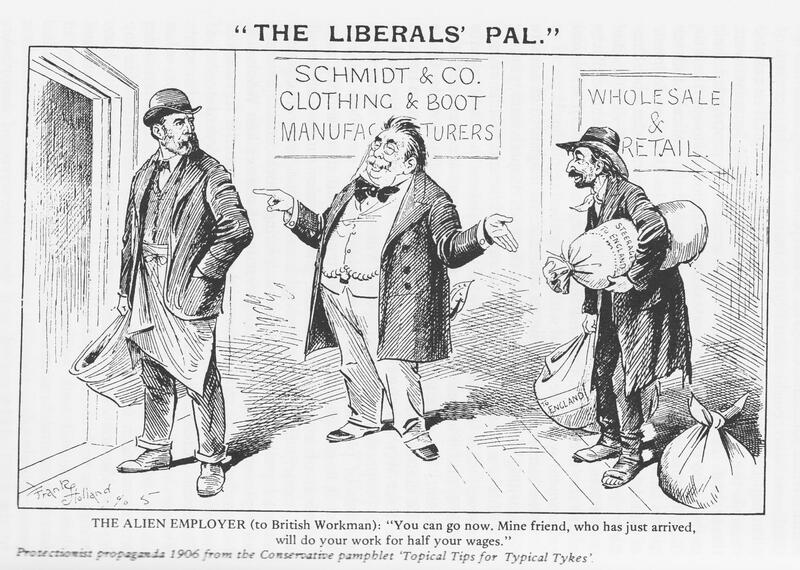 The exploitative employer is clearly meant to be one of the Ashkenazi Jews, speaking either Yiddish or German, who began to arrive in Britain en masse from the 1880s onwards fleeing persecution in the Russian Empire. Unfortunately, the fears that manufacturers would sack British workers in favour of employing much cheaper immigrant labour weren’t always unjustified. The mass riots that broke out in 1909 across England against Chinese immigrant workers had their origins in the sacking by one of the northern businesses of its White workers in favour of Chinese. This episode cast a very long shadow over British politics. The deaths of the Chinese cocklers at Morecambe Bay and a group of 30 Chinese illegal immigrants, who were found dead in the back of a lorry at Dover, prompted the Independent columnist, Yasmin Alibhai-Browne, to write a piece claiming that these two horrific incidents were part of a continuous British racist hatred of the Chinese dating back to the 1909 riots. There have been similar strikes and protests about the introduction of cheap immigrant labour since, though the reality may often be very different from the simple racism attributed to them by the press. Owen Jones in his book, Chavs, discusses one such strike, which was presented in the press as racist British proles versus immigrant labourers. But the unions leading the strike were also very much concerned that the immigrants weren’t being paid the same wages that they should have been paid, if they were workers. They strike was also partly a struggle to give these workers equal treatment with the existing British staff. Unfortunately, the Tories have been trying to stir up the same fears since they weren’t elected in 2010. Remember how they tried to compete with UKIP for the anti-immigrant vote by promising to strengthen anti-immigration legislation, and put up posters everywhere asking people to inform on illegal immigrants? And let’s not forget the posters they also pasted up, offering to repatriate illegal immigrants for free, if they wanted to hand themselves in. So far, though, they haven’t tried to play on anti-immigrant sentiment in the Brexit debate. Or at least, not the same hysterical extent. They’re probably too worried about the fall-out they had from the last such attempts, as well as real fears that the beneficiaries of any attempt to work up xenophobia will be the hard Right, like the various goose-stepping Storm Troopers currently fouling the rest of Europe. The Far Right in this country has collapsed back to miniscule, squabbling grouplets and splinter organisations after looking like the might become a serious mass party. Nobody really wants that eventuality, so there seems to be a consensus at the moment not to hand them a weapon by starting a debate about the EU and immigration. But I do wonder how long it will last. And certainly, there is a lot of fear out there about mass immigration from Europe. So I’m left wondering how long it will be before the Tories feel secure enough to go back to using images and tactics like the above cartoon again.